Lezhe county lies on the northwest of Albania. It has a small western shoreline on the Adriatic Sea. It consists of the districts of Kurbin, Lezhe (with the eponymous capital of Lezhe City) and Mirdite. Lezhe City has a small population (pop: 20,000), and is located not far from the famous Shengjin (Saint Gean) beach and some 5 km from Tirana. The city pays tribute to Gjerg Kastrioti Skanderberg, the 15th century national hero who defended Albania against the Turkish invaders, whose beautiful memorial stands in Lezhe. 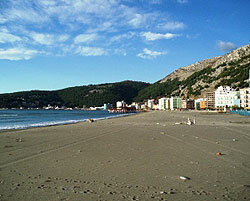 Shenjin's beach is wide and flat.There are pine trees everywhere, like Mali Robit (Durres). Evidence of a growing property market is clear in the hideous and enormous 7 and 8-storey blocks rising on the beaches edge. If the government limits construction in Shengjin, the area could keep some its beauty, with the breathtaking mountain backdrop falling to the fine grey sand through the romantic pines, but frankly, that kind of restraint seems unlikely.